Every LED on the front is individually addressable, and each LED can be set to 256 different brightness levels. Additionally, the entire LED matrix can be dimmed or brightened 256 levels without affecting the overall brightness resolution for individual pixels. There is a light sensor to allow automatic brightness control, or possibly communication with other devices. The hinges, nose pad, and battery box are all 3D printed. The hinges and nose pad are made from 618 nylon, for the best strength and flexibility available in 3D printed parts today. We're still working on fine tuning the design, as they fit most faces well but not quite all. However, we'll release the 3D files and also help out with any problems getting them to fit securely. A lanyard is still a really good idea, because you don't want to drop these. Production overran our expected costs by a lot, especially for our first run...so we had to price a little higher than we initially hoped. 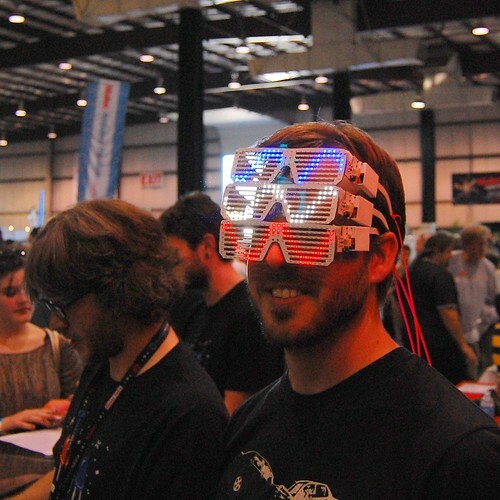 At Maker Faire we launched with introductory pricing of $160. At that pricing, we sold out of our first production run! 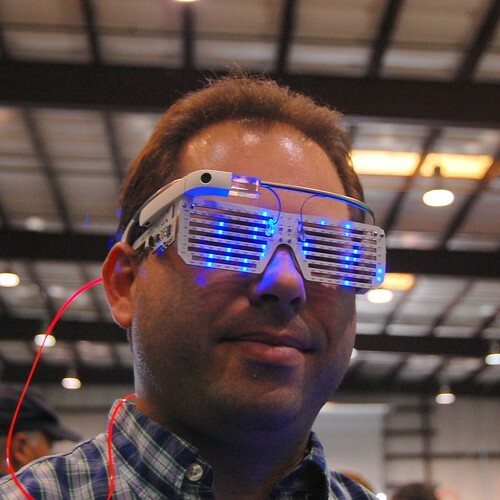 We had a computer running the Arduino IDE and helped each customer put whatever text messages they wanted on the shades. 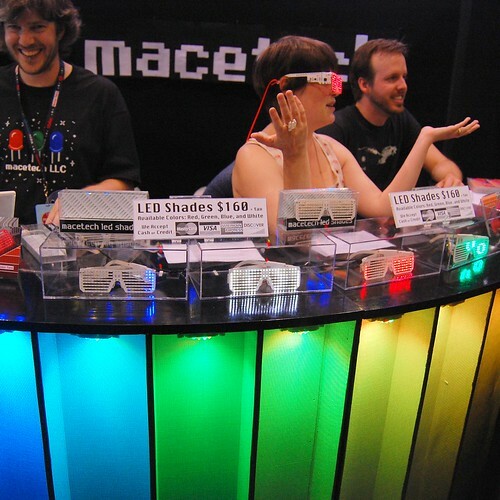 The Maker Faire crowd absolutely loved our LED Shades, and as always were overflowing with great ideas, advice, praise, and criticism...all welcome! 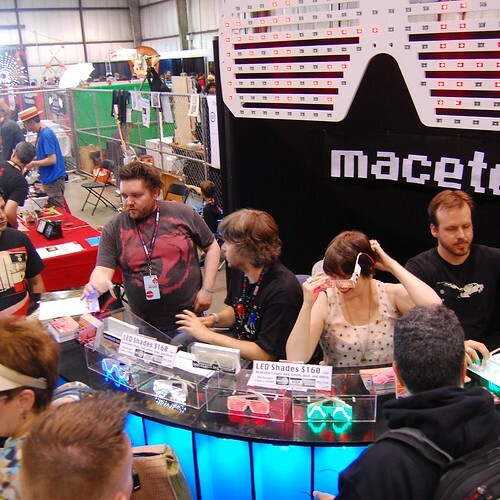 This is why we always go overboard building out our booth, although it crowds out our garage space for a few weeks. 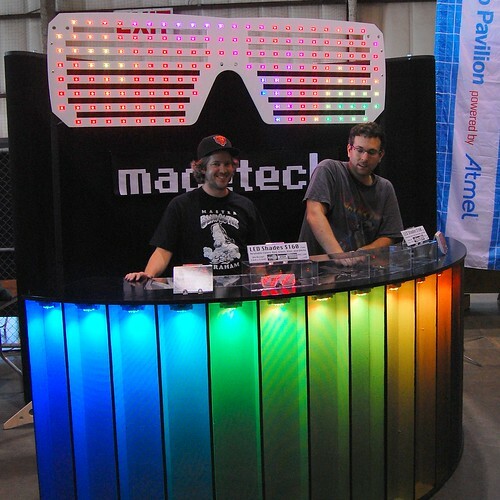 This year, we used the ShopBot at TechShop in Menlo Park to cut a giant set of LED Shades out of plywood. Then we used some WS2811-based pixel strings to light each of the 166 LED locations. The giant shades were controlled using Processing on a laptop, through a PJRC Teensy 3.0. We brought back 2/3rds of the circular LED kiosk from last year, lit with Satellite S-001 modules and OctoBars. 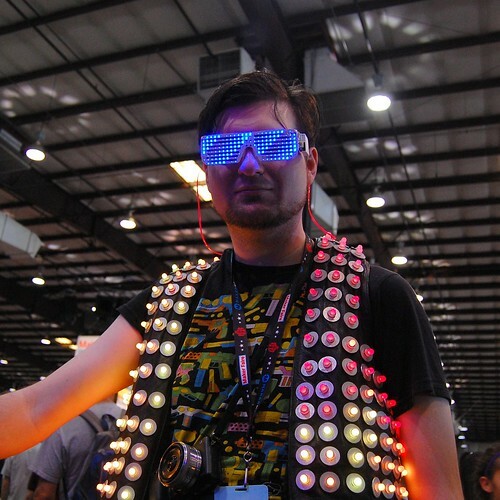 Exhibiting at Maker Faire is physically and mentally exhausting. Every year we believe that we'll somehow take shifts and let people go out and see the rest of the Faire, but we end up having to stay in the booth even more. 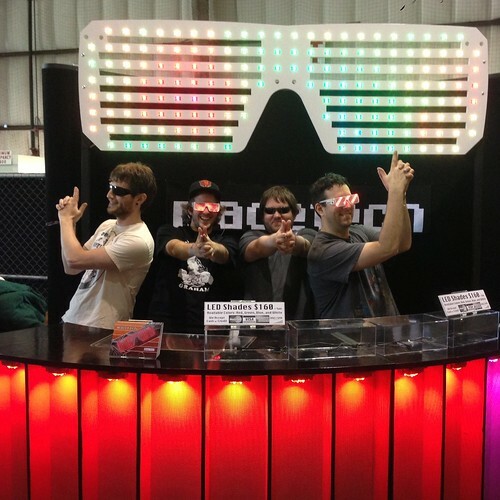 Many thanks to our friends who helped set up, answer questions, let people try on LED Shades, and brought us food: Matt, Graham, Ethan, Karly, Adrian, Arch, Nio, Nazak, and more!! 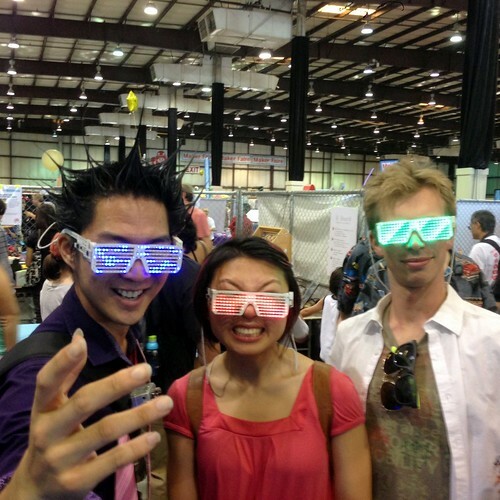 That's a wrap for Maker Faire 2013. 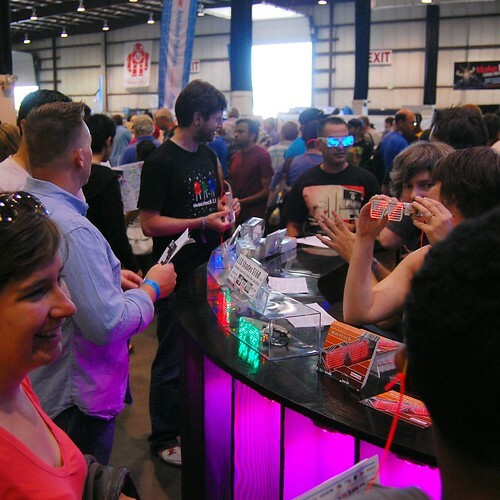 We'll be at Maker Faire NYC (as attendees only!) 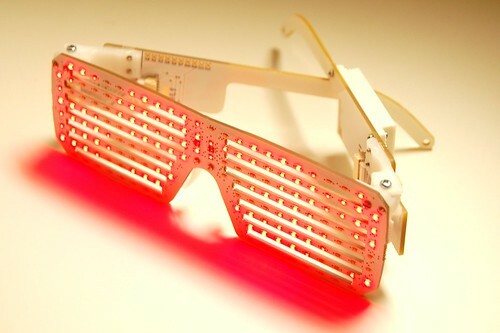 but will keep working on the LED Shades and other exciting new devices. 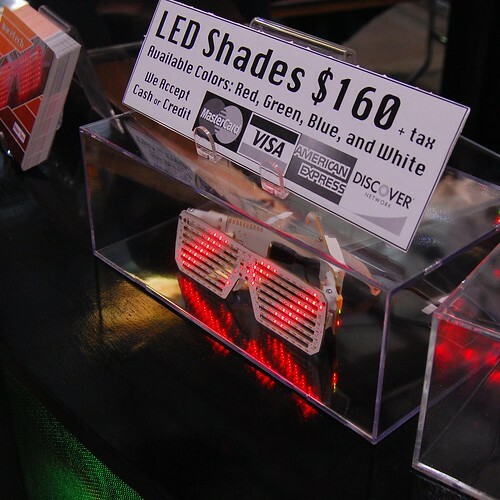 We're putting together some more LED Shades and will have them in our store soon! Thanks everyone who stopped by! Submitted by Anonymous (not verified) on Thu, 05/30/2013 - 19:42. The booth looks great. Congratulations! Submitted by Anonymous (not verified) on Sun, 08/25/2013 - 10:42. I still want some LEDs for my braces. Trust me, they would sell like hotcakes! Submitted by LOUIE (not verified) on Sat, 08/10/2013 - 09:10. Submitted by Trayon Campbell (not verified) on Sun, 08/18/2013 - 04:49. I am very interested in buying two pair of your glasses. I'd like a pair of the blue, and one pair of the red led lights.Please get back to me at your soonest convenience. Submitted by LEO (not verified) on Thu, 10/17/2013 - 23:01. Submitted by Anonymous (not verified) on Fri, 10/25/2013 - 11:21. Hey Im sorry how do you change the text on the shades? Submitted by Garrett on Fri, 10/25/2013 - 13:19. Submitted by Parker (not verified) on Thu, 02/27/2014 - 20:37. I would love a pair of the blue glasses to show off at Coachella this year. I'm also taking an arduino programming class and would like to demonstrate them to my classmates. Thanks.